Two negatives makes a positive. But we need a cheerleader for preexisting medical conditions. 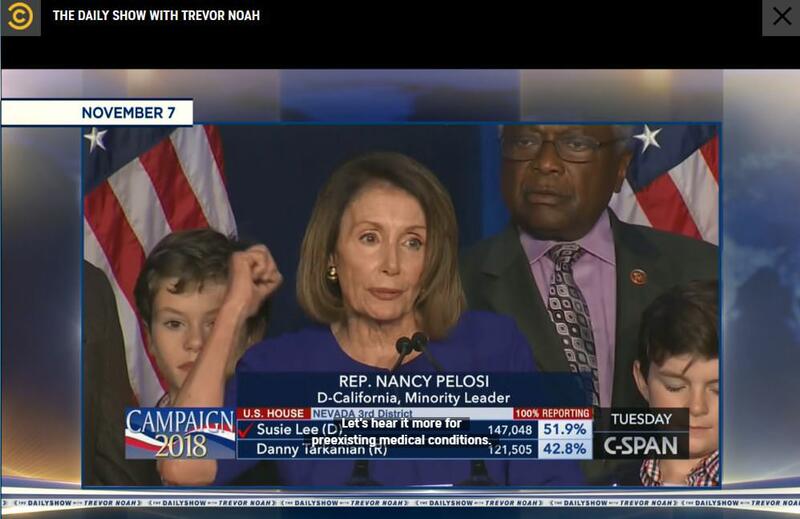 Pelosi is the only Democratic leader with any balls. She shouldn't be minority leader in the house, she should be president. Do you still believe this nonsense? To say Nancy Pelosi is a political doormat would be an insult to all doormats around the world. If the job of the Dem leadership is to take in money from billionaire donors and proponents of the military industrial complex, to keep big Pharma happy (and paying bribes) by fighting against universal healthcare, to fight off real progressives within her own party—and at the same time, deflect Dem accountability by saying, “Squirrel!” (Sounds like ‘Trump’ for the past two years), then she is doing a magnificent job. You can slice through corporate Dems and progressives neatly, based on their opinions of Pelosi’s value to the party and to the general public. Yes. Pelosi would do a much better job than most politicians today. Pelosi won over 85% of the votes. That simply means the voters have confidence in her knowledge and skills as a woman in politics. Are you referring to the voters who elected Gavin Newsom as governor? I believe there will be some resistance within the Democrat delegation to Pelosi's election as speaker, but that she will indeed be elected. Joe hasn't posted in a couple of years, so I doubt he'll answer, but yes, Pelosi, having done a strong job as Speaker the first time around is clearly the right candidate. On top of knowing how to do the job correctly, she is a powerful fundraiser and played a key role in guiding the Democratic message that led them to the majority. As long as she is grooming the next generation, she is the right choice. The way she operates precludes grooming the next generation. Yes, I believe that Pelosi would be the best person to be Speaker of the House at this time. I fully support Pelosi as Speaker at this time. I suspect she is very aware of the emerging left win elements of the Democrat party. If I am not mistaken she has already labeled her sought next term as Speaker as a "transitional' one for the party. She is an able organizer and a very adept fund raiser for the party, and I believe will win the caucus vote by a good margin. Her problems will start after that. It is curiously ironic that the forthcoming Democrat House appears to have one the salient characteristics of the Republican one it is replacing, a fractious new extreme movement seeking to overthrow the establishment of the party. Her promise of an interim speakership is BS. The fact that all the conservatives are against her ought to be proof that she should be house leader. Pochantas might put it to Trump like a few investigations never done by republicans. Pelosi has so much financial power within the party that everyone is afraid to run against her. Just one of the many, many things wrong with our political system. I don't believe there are generally "system" solutions for every problem, particularly in politics. History provides a few examples of particularly effective "systems" in China, the early Ottoman Empire, and the Western Democracies, but most age, decay and became corrupted & ineffective over time. The individual (and highly non-linear) human element is important as well, and, as history amply demonstrates, given enough time, humans find ways of advancing their self-interests in defiance of all systems. We shall see if the modern "systems" ( such as the EU) fare any better. The chief virtues of our "system" are, in my view, the checks and balances that limit the excesses (both good and bad) of all parties to the process. I believe that one of the chief causes of our current divide is the gradual bureaucratization of our government, and the associated removal of decisions affecting peoples lives from the political process itself. The temper of the people and their representatives in politics today reflects this and several other divides. We have survived worse, but success is not guaranteed to anyone. What are you talking about? I'm for Pelosi. She has always had good relations with the gun rights movement. Pelosi backed off early about impeachment proceedings. » Nancy Pelosi -- Should she maintain a leadership position for the dems?